KATHERINE MANSFIELD translated into French! Katherine would have been very pleased. It's my dear Provencal friend, Brisou Buis, who translated it. I tried to convince her to read Proust so we could talk about it over a morning tisane or an evening glass of wine, but she said she'd prefer to translate my novel. And she did. When Brisou and I converse, she in English and me in French, we understand each other. But for her to translate my words and Katherine's into French took great determination and patience. In September, I will visit her at her 16th Century hameau in southern France. We will sit on her sunny terrace under the shade of an ancient walnut tree and raise our glasses to Katherine Mansfield - our Muse. The genesis of In Pursuit . . . began in a used bookstore in a small village in southern France. I was looking for a book to read on my return flight to New York. There was one on a high dusty shelf crammed with English books. I read through the spine titles and author names. My discerning eye stopped on "The Garden Party and Other Short Stories" squeezed amongst the classics. Katherine Mansfield? Why do I know that name? Oh yes, in Virginia Woolf’s journal she remarked that Katherine was the only writer she was ever jealous of. Why not find out why, I thought, and reached up and pulled down the thin tattered book that was just the right size for my purse. That brief moment led to my three and a half year odyssey in pursuit of Katherine Mansfield’s story. Riveted to my airplane seat, I read her stories and discovered why Virginia Woolf was so jealous. What struggling young writer, like Virginia, wouldn’t be jealous of a contemporary writer who could put so much compassion, empathy and meaning into so few words? But it wasn’t just Katherine’s stories that kept me riveted to my seat even as the jet landed at JFK Airport, it was reading the brief description of her life written by her husband, John Middleton Murry I knew right then that I wanted to recreate her story. I had reached a difficult crossroad in my own writing. I had spent that summer working on an autobiographical novel that I wasn’t at all satisfied with. I had every intention of continuing with it when I could find the time, but as Virginia Woolf said, ‘life interrupts.’ And in this case it wasn’t my life but Katherine’s that interrupted. She could not be ignored. I had to write her story – the story of a woman who managed to cut out a brilliant and creative life for herself with everything working against her; the story of an individual’s powerful determination to surmount the limitations forced upon her by illness. I wanted to tell her story so that others might be as inspired by it as I was. Under the hot shower or before rising in the morning I was creating scenes with Katherine and Virginia, Katherine and LM, Katherine and Jack, Katherine alone. I was anxious to write it all down. In the isolated beach house surrounded by the tapping keyboards of four other writers deter- mined to get much work done in one week, I faced the blank page on my laptop’s monitor screen. I sat ever so still. Then I too started to tap my fingers across the keys and Katherine and Ida Baker and Jack came into my interior vision. By the end of the week I had an opening chapter that catapulted Katherine’s story into the 21st century. Tuberculosis became lung cancer. The Bloomsbury Group became the New York literary scene. Menton was transferred to Miami. 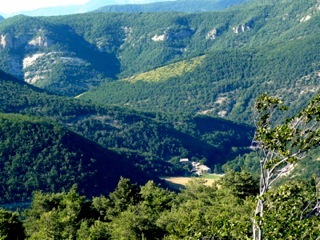 The Alps to Teyssières. But surprisingly it was Ida’s voice that spoke, not Katherine’s. It was the voice of the caregiver, not the one being cared for. I wrote the first draft, but neither Katherine nor Ida nor Jack were comfortable in the 21st century, and nor was I. In the second draft I moved them back into the early 20th century where I thought they belonged. I worked on this draft when I could find the time, knowing that the bulk of the work would take place the next summer in France. I’m a freelance editor in New York City. It pays for my writing habit. In the summers my husband and I retreat to a farmhouse in southern France to plant and harvest our creative work. We bring our harvest back to the States to sell in the marketplace. In Teyssières, I settled down in my writing room and read the second draft. I wanted to love it but the writing was forced and worse it wasn’t the story I had envisioned tell- ing. The voice was wrong. The point of view was wrong. Katherine had to tell this story, no one else could do it justice. The story wasn’t about what Ida did for Katherine, as important as that was; it was about what Katherine did for Ida. So what does a writer do when the story doesn’t work? Reams of printed pages went in the recycle bin. The only files I kept were the massive research notes I had written that included an old soapbox packed with 5 x 7 index cards. I started a third draft, this time from Katherine’s point of view. My daughter Amie came with me to Bandol. We stayed at a hotel literally overhanging the Mediterranean Sea and only a short walk from Villa Pauline – so close that before I went to sleep that night Katherine’s spirit slipped under my skin and has been with me ever since. In the car, Amie read aloud the letters written back and forth between Jack and Katherine when they were separated, and when Katherine was very ill, scared and alone. We cried together over some of the passages and I had to pull over and take a deep breath to avoid driving off a cliff. 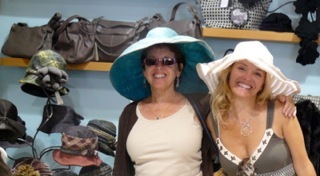 We went hat shopping in Cassis to escape from Katherine’s grip on us. By autumn I had planted the seeds of Katherine’s story but I knew it would take much more work before the harvest. I started to see the end of my quest as I approached the last pages of the manuscript. Some days I was exhausted but I had a time limit and I’d have to return to New York shortly where I wouldn’t have the time to write, particularly under such suitably quiet and isolated conditions, surrounded by nature and the blossoming yellow flowers whose essence, Genêt Fleuri, was Katherine’s favorite perfume, an essence that Virginia Woolf found too earthy. I had to finish soon. And, like Virginia, I also had Katherine’s formidable presence to deal with. She would not leave me alone – no, really. She wanted me to finish "In Pursuit . . ." so she could sink into its pages or better still rise from them. When I took breaks and rested in a hammock under a 100-year-old walnut tree, Katherine would come to me as a monarch butterfly and sit on my shoulder. I revised the last chapter of my manuscript at the writers’ retreat at Outer Banks and read it to a very supportive and enthusiastic writing group. They too had become fascinated by Katherine’s life and were often coming to me with quotes and pictures they’d found on the Internet, and they read her stories for the first time. I returned to New York filled with anticipation and expectations. I printed my 330-page manuscript and held it in my hands for the first time. I then wrote the perfect query letter and, after researching the most appropriate ones, sent it out to fifteen agents. All fifteen rejected me. The gatekeepers on guard at the pearly publishing houses told me it was impossible for an unpublished writer to get published in this recession-driven marketplace. My husband Jim Payne and my editor Steve Lewis never gave up on Katherine’s story and kept encouraging me to self-publish. I hesitated and then, because they’re smart guys, I took their advice and sacri- ficed a summer of reading and writing and reflecting (my favourite occupations) to get down to the business of self-publishing because Katherine wouldn’t rest in my desk drawer. In- stead, after choosing Createspace/Amazon for my printer/distributor, I spent the summer assembling a book. The details were endless and the full weight of what I had set myself up to do – produce a book from cover to cover – was overwhelming. A cover! What would I use for the cover? In a despairing moment, a brown paper bag came to mind. Then I remembered a folder of my son Sam’s artwork in my photo library. There I found the perfect painting for the cover of "Katherine Mansfield". As the summer weeks turned into months I copyedited my own manuscript and then proofread it. I thought of Virginia and Leonard Woolf’s Hogarth press and how all their work had been self- published. The image of Virginia bending over the ink-stained printing press to hand set Katherine’s sixty-eight-page ‘Prelude’ made what I was doing seem less arduous. I finally came home with my harvest – a completed book ready to enter the marketplace. Was it all worthwhile? Yes! Absolutely! "In Pursuit . . ." reviews are starting to show up! Ah . . . I can feel those beating wings of happiness against my blushing cheek, whispering, "happy new year." The term they use in the television world is ‘edutainment’, a blurring of the lines between an entertaining tale and informative education. And this is what Joanna Fitzpatrick has done with "In Pursuit. . ." an absorbing account of Katherine Mansfield’s extraordinary life, from the moment she left New Zealand aged 18, through to her early death at 34. Particularly captivating are the conversations with the Bloomsbury crowd, especially the intimate discussions between Virginia Woolf and Mansfield. For those accustomed to reading Woolf, it can be difficult to imagine that she speaks or thinks in anything other than flow of consciousness. Whilst the conversation is never that of hair braiding and boy crushes, tender words expressed between the two women over a cup of chamomile tea adds a personal dimension so often missed in the image of this author’s persona. Disputes between Lawrence and Mansfield, dinners with HG Wells and correspondence across the literary scene sweep out the pedestal from under these authors, illustrating their very human essence, whilst never removing the reverence that their literature deserves. “In Pursuit . . .” is not only a captivating but a thought-provoking read. A beautifully crafted novel that will move and inspire you. The beauty of this book is that FitzPatrick presents Katherine Mansfield, not like an enigma, but a very real person. Through the book we get to know this talented and brave young woman. Despite everything, her determination to fight her situation is really awe-inspiring. “In Pursuit . . .” is a poignant description of the brief life of a very talented woman. Okay, Katherine Mansfield, what do I do now? What do I do now? I ask myself and Katherine. Yet I think I know what she would say. Move on. Yes, face the truth - face the blank page. Risk it all! Start your next book But what about "In Pursuit . . ."? Leave it. Let it have a life of its own. Okay, I say again. Good plan. So tonight I will go hear my dear friends Fred Hersch, piano, Janis Siegel, vocals. Two people dear to my heart and who have shared part of my life. There is nothing like live music to make one feel very alive and grateful for it. Happy Thanksgiving to all particularly those who are alone. As Katherine Mansfield would say this letter is my arms wrapping around you. This is my third website and this one is incorruptible! I have been unable to write in Let's Talk for several weeks as my new site was being built on Squarespace by my wonderful new designer, Angelie. For those of you who haven't been following my web site construction: My first website this summer was corrupted under my writer's touch. The second site was ardulously built and completely unmanageable. The third site, this one, is fantastic. So you'll be hearing a lot more from me as I can even write blogs from my iPhone. How cool is that! "In Pursuit . . ." has been out now for a few weeks and I'm sure Katherine Mansfield would be pleased with the results so far. Readers are buying. Rave reviews are coming in! You can check them out on my web page review page. And thanks to all of you that have made comments on my previous articles. I had to paste them in from my website graveyard so it looks like I wrote them but I signed with your names. Needless to say I have been spending too much time in technological purgatory. I even took the risk, as Katherine Mansfield would have, and upgraded my operating system (OS for those of you who know this stuff). For those who would prefer a literary translation I went from being a Tiger to a Snow Leopard and in the transition lost all my files for around 48 hours. But they have now been retrieved and I am ready to move forward. I get to be a writer again! I woke up the other day with a new character residing in my brain waiting to be developed in my next novel, instead of excessive thoughts on codes and pings and unresolvable computer glitches. And now that I have this wonderful new site to work on, and it's so easy, I will be adding worthwhile links, increasing my gallery and writing articles about Katherine Mansfield and biographical fiction. So please visit again soon. And feel free to contact me about Squarespace if you want to build your own website. Risk anything! Care no more for the opinions of others, for those voices. Do the hardest thing on earth for you. Act for your self. Face the truth. Katherine’s quote seems appropriate for today as I just completed what I consider “the hardest think for me to do on earth” and let me tell you – I am celebrating! Because after many brilliant moments and some arduous labor pains, Katherine Mansfield has come to life. And there is no denying that it is a thrill to hold it in my hands - a one pound, 8"x 5.2"x .08”, 130,000 words, and 348 pages – filled with my words. The Katherine Mansfield Story has gone to print!!! I'm treating you as a friend asking you to share my present minuses in the hope that I can ask you to share my future pluses. Today I got exciting news from CreateSpace: “Katherine Mansfield” has been ordered and will be shipped to you within five days. What that means is that I am about to actually, after all these arduous mounts, going to touch finished product. Not the stack of manuscript sheets proudly displayed on my bookshelf or the PDF file but the book itself will be in my hands and I can open the cover and look between the sheets. That’s cool. Meanwhile what have I been doing and what will I be doing? Internet Marketing 101 – what else! Long tedious hours pursuing ways to make “Katherine Mansfield" available to the public thorugh my website. Ah yes, speaking of websites, mine is still in constuction. It has taken way longer than I could ever have imagined. And the writer? What has she been doing? Not a word. And there won’t be a word put to the blank page until I go on my retreat in January. Until then I will continue to market “In Pursuit . . .“ in a responsible manner. I owe it to Katherine Mansfield’s memory and to myself for she would haunt me to the end of my days if I left her hanging. So though I can’t develop a character, or write dialog, or place a scene, I can still blog. It’s not exactly the same as putting down words on a blank page but it’s better than no writing. So with that thought I am going to make myself a vodka gimlet. Then I am going lift my glass to all you writers who know the pain of not writing. You who know that feeling when someone asks “what do you do?” and your immediate response is “I’m a writer” and then you immediately ask yourself if that is entirely true seeing you haven’t put ink to paper or fingers to keys in months! Wait that is not entirely true. Today I spent condensing my 333-page biographical novel into a 500-word plot summary. Not easy. In the next few days I will put the plot summary up on my site so you can see how I did manage to compress “In Pursuit . . .” from 110,000 words to 500. Katherine Mansfield was a mistress at condensing her stories. And if you don’t know that I suggest you read one of her short story collections. There is a reason for Virginia’s Woolf’s jealousy toward Katherine’s work. And if I was tech-smart I would code a highlight here that would immediately link you to Amazon and Katherine Mansfield’s book collections. I still have to work on that. But I will in the future recommend several of Mansfield’s short stories. Katherine Mansfield is out on Kindle, Barnes and Noble and iBooks!!! How often these past few months have I moaned over that Katherine Mansfield quote while occupied with publishing my book. And now here comes another deterrent from being a writer again – Marketing 102;"Build it and they will come." But with 21st century book releases it's more about Link-it and they might come. So I have built my web page and linked it to virtually millions. I have also linked to Wikipedia, Goodreads, and Amazon. And before Katherine's 122 birthday candles blow out tonight I must tweet the book release announcement to Tweeter and face it on Facebook and send out countless emails. If Katherine's extraordinary life hadn't been so brief, perhaps it would not have haunted me as much as it has, and been a driving force behind my publication efforts. Even in the summer seasons during the past three years when I was researching and writing "In Pursuit . . ." she didn't leave me alone. I would be reclining in my hammock under an ancient walnut tree in the south of France and her spirit would land in the form of a stunning black and gold butterfly on my shoulder and flutter her wings to say, "What are you doing out here? 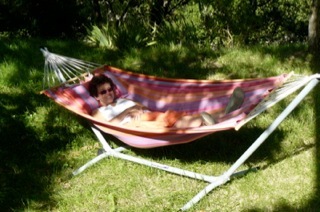 You promised to write my story and you can't do it lying in a hammock. And now the book cover has been chosen. The readable font decided upon. And I am just waiting to approve the final proof before it goes to print.